If you are looking for more in-depth information about the game of roulette and how it is played, you have come to the right place. 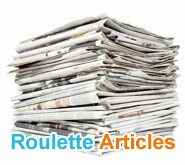 Below is a collection of roulette articles covering both the physical as well as psychological aspects of the game. These articles should help with your understanding of the game, as well as help you to get the most from your time spent playing online roulette. What is the "Snake" Bet?